It has been for.ev.a since I created a Polyvore set for our Style Lookbook. 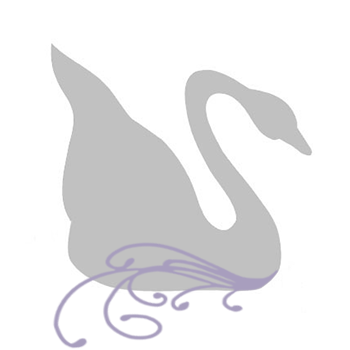 And since I last logged into Polyvore, it seems it has changed -a lot! 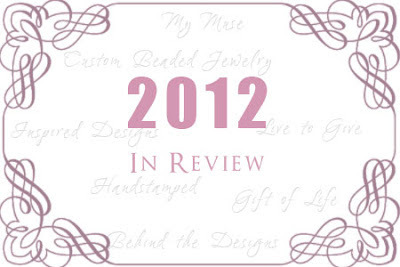 I think the biggest change has been that I can no longer, easily, clip my handmade beaded jewelry to the Polyvore site. This presents a problem, that I will have to address. But, I took a round about way to clip a pair of our beautiful Heart Jewelry earrings to create this richly seductive style look. 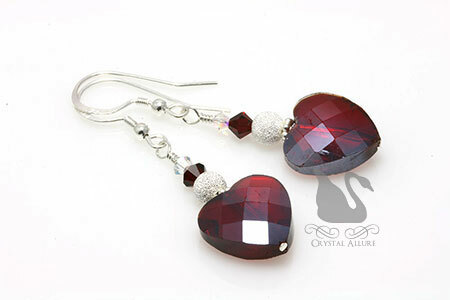 Paired in this Just Kiss Me set is our Adoring Love Red Heart Crystal Beaded Earrings (E284-R). Love it!!! But if you're not quite the RED kinda gal, there is also Adoring Love Pink Heart Crystal Beaded Earrings (E284-P) to choose from! A seductive deep ruby red faceted glass heart is accented with sterling pave style beads, Bali, red and aurora borealis Swarovski Crystals. Handmade beaded earrings are finished with sterling silver french hook ear wires. Length is 1-1/4" from bottom of ear wire. A sweet princess pink faceted glass heart is accented with sterling pave style beads, Bali, pink AB and aurora borealis Swarovski Crystals. Handmade beaded earrings are finished with sterling silver french hook ear wires. Length is 1-1/4" from bottom of ear wire. So what's your favorite Valentine's Day color? Red, pink, fuchsia, cranberry? The premise would be, now that the holidays are over, it's time to focus and get back to business. Right? Well, that was the game plan for yesterday (Sunday), until....the weather was slated to be in the upper 60s. For January, that's crazy!! But, sure enough, it hit 69 degrees! I almost felt like heading out and getting some flowers to plant! Instead, I got some walking time in. As well as, play time with my daughter; who, in case I haven't mentioned, is just giddy in love with pink. I do believe her philosophy is: I am Pink, therefore, I am. Pink, pink, pink...everything must be pink. While I prefer a more vibrant shade of pink, she does look adorable in any shade of the color. No matter the shade of pink, you cannot argue, it is a very feminine, girly color. Ironically, my mother, daughter and myself all celebrate our birthdays in February, which is also, the month of celebrating love and romance on Valentine's Day. 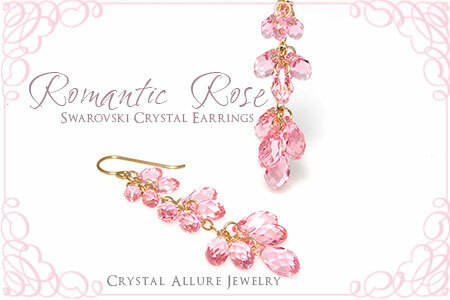 With Valentine's Day fast approaching, it's no surprise to me that inquiries for Swarovski Crystal Heart Jewelry are already pouring in. I took some time to sit down in the studio and created this pair of lovely romantic cascading drop earrings (above). Although the handmade beaded earrings shown above are not hearts, the beautiful pink rose Swarovski Crystal teardrops make them the perfect accessory (or gift!) this Valentine's Day. This stunning pair of handmade beaded earrings feature 26 points! 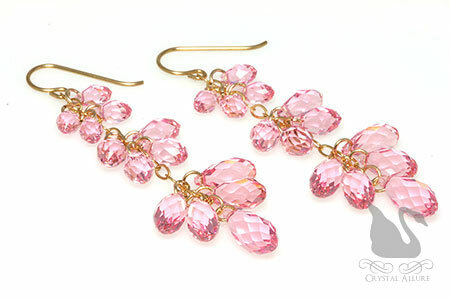 of sparkling rose pink Swarovski Crystal teardrops daintily dripping from 14 karat gold fill chain and french hook ear wires. Length is 2-1/4" from the bottom of the ear wire.